a recent visit to the wine show at the business design centre gave me ample opportunity to experience and observe three great examples of brand engagement. the first was a wine tasting crash course by Threshers, which gave me and my mate Astrid a steer on the best things to look for and ask whilst wine tasting. 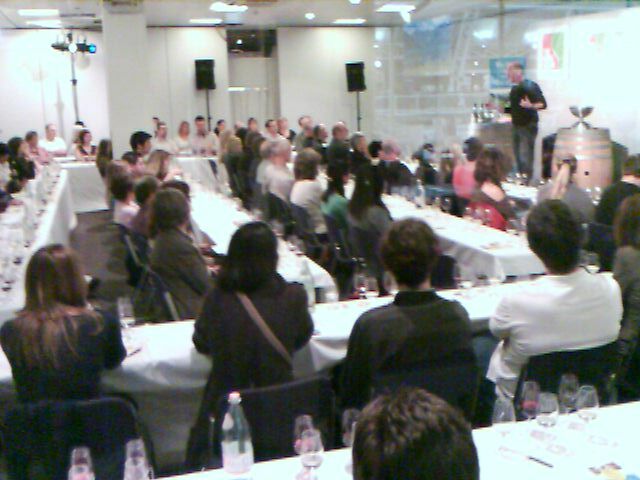 the second was watching for a while a wine tasting theatre sponsored by Vinopolis, with Oz Clarke running the proceedings (pic above). finally, Sainsbury’s were there too – suggesting which wines would best go with different foods, and of course allowing you to sample as you went along! these three experiences are to my mind examples of why it’s not enough for a brand just to be at an event. it’s not enough to say ‘this is who we are’… I remember these three examples because they were working hard to give consumers a genuine experience above and beyond that which they would have had just by going to the event. call it added value, call it engagement, call it experiential marketing. call it whatever you want… these three brands made an effort. it was appreciated. and they will be remembered I’m sure by more then just myself and my mate Astrid.